Sprint BlackBerry Curve 8350i sign up page | BlackBerry Blast! 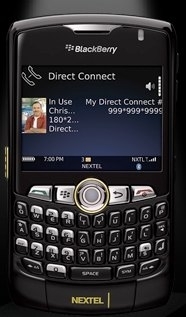 It seems a little silly to be releasing a BlackBerry that is not a Storm, Flip, or Javelin, but Sprint is releasing a Curve with Nextel Direct Connect. Sprint has launched a sign up page for their Nextel BlackBerry 8350i. You can sign up to be notified when the 8350i is available. No new information is given other than the fact that the BlackBerry 8350i will have both Wi-Fi and GPS, and of course the push to talk feature.